Shark Defenders just created our first country specific Facebook page, Fiji Shark Defenders. We are still working on the basics of the page, but could use your help to get us our first few fans. 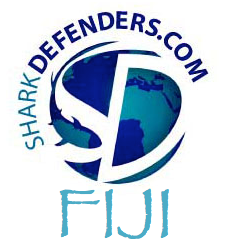 Please visit our new Facebook page at www.facebook.com/FijiSharkDefenders and click "LIKE." 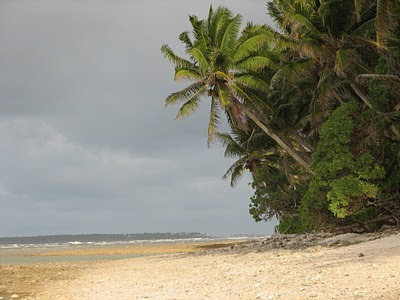 The goal of Shark Defenders in Fiji is the same as our goal around the world, to create shark sanctuaries and support the proper management of shark and ray species. 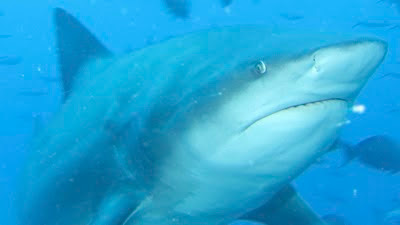 The Shark Defenders team got in a few dives over the weekend and came face to face with this inquisitive bull shark (Carcharhinus leucas) on Beqa Adventure Divers shark dive in Pacific Harbour, Fiji. If only we could spend all our time trying to get the perfect shot of every species of shark! Shark Defenders tries to use high quality photos in our materials, including our blog posts and Google Ocean shark stories. 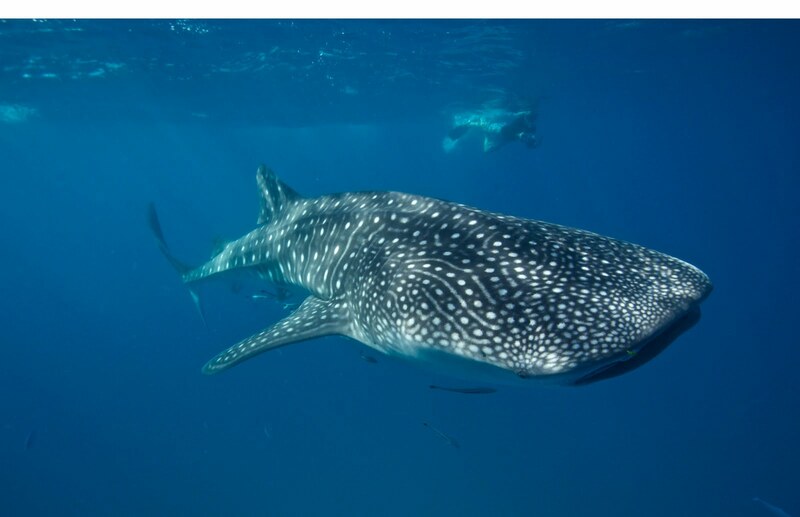 If you are a diver and have taken high quality photos of sharks and would like to donate them for our use in advocating for shark protections, please visit our Donate Photos link on this blog. Great news! California's AB 376, which would make it unlawful for any person to possess, sell, offer for sale, trade or distribute a shark fin, just passed the California Assembly Committee on Water, Parks, and Wildlife by a vote of 12-0. The bill now moves to the Assembly floor, and from there on to the Senate. Supporters note that sharks are critical to the health and balance of the ocean ecosystem and their extinction would be devastating to the biodiversity of the oceans of the world. Demand for shark fin drives overfishing of sharks and has contributed significantly to recent shark population declines. 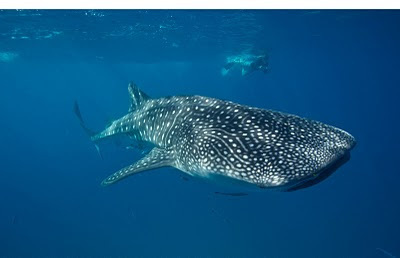 Some species have been depleted by as much as 90% and over a third of shark species are threatened with extinction. Supporters assert that currently there are no recognized sustainable shark fisheries, and note that sharks are particularly susceptible to overfishing due to low reproductive rates and their role as top predators in the marine food chain. Supporters also assert that current state and federal laws have been ineffective in curbing the practice of shark finning as long as trade in fins is allowed to continue in response to market demand. 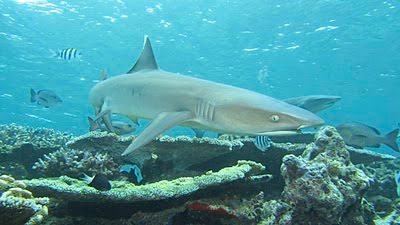 While recognizing that shark finning has been important to Chinese culture for centuries, supporters assert collapse of ocean ecosystems must take precedence over cultural culinary heritage, noting also that many governments and businesses in the Pacific region have recognized the urgency to save sharks and implemented progressive protection measures. Recreational fishing organizations assert that shark finning is inconsistent with sustainable fishing practices. Some supporters also emphasize the cruelty of shark finning, which often involves cutting off the fins and tails of sharks and throwing the fish back in the ocean alive where they are likely to die a slow death. Finally, some supporters note the high level of mercury in shark meat makes them unhealthy to eat. Today, our national menu of shark and bake is now imported Guyanese catfish and bake. Shark populations have been decimated. Other countries are responding and so, too, can we. Fishermen and Friends of the Sea (FFOS) calls on our Government to take a position on this national crisis. 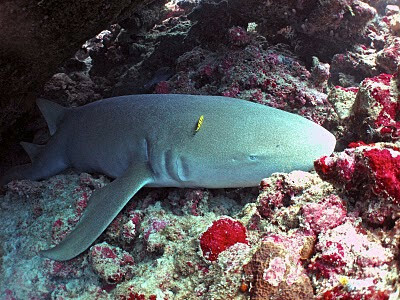 Last week, Guam's governor signed "Bill 44" to ban shark finning after the proposal was unanimously passed by legislators. Guam is the third place which has recently put a law into place that bans the sale, possession and distribution of shark fins. This practice has become more prevalent over the years because of the rise in popularity of shark fin soup, an Asian delicacy. Worldwide, more than 70 million sharks are killed by finning each year and, often, the shark's body is disposed of in the sea alive after the brutal process of cutting off the fin. Here, in Trinidad and Tobago, over 50 Asian industrial long-line vessels (that berth in Sea Lots) hang thousands of fins to dry in the sun each day. These large sharks are caught offshore before they are able to come inshore to reproduce. Guam must be the model for the future of shark preservation in Trinidad and Tobago. Sharks are vital for the ocean's ecosystem. As soon as you start to take out an important part of the food chain, eventually, it's going to collapse without that vital link. It is essential we preserve these amazing creatures and not let them be destroyed in this horrible and wasteful practice. Our People's Partnership Govern- ment has a mandate to return this country to sustainable and regulated harvesting. This activity cannot be sustained. We are proud of Guam's decision and lend our full support to Food Production Minister Vasant Bharath, so he will lead us in their progressive footsteps. Student's from California's Eastshore Elementary School gathered 200 signatures in support of AB 376 this weekend at Dana Point's Festival of the Whales. 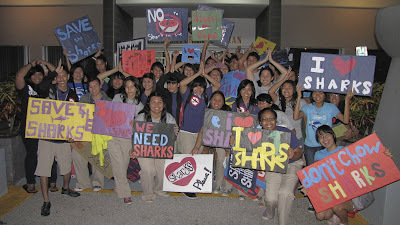 The students have started a website at www.ilovesharks.org. The website has middle school science lessons on sharks and materials for students, teachers, and the public to write letters to their legislators encouraging them to support a ban on shark fin products like the state of Hawaii has already done. the United States to enact a law that further protects the shark population. The law prohibits the possession, sale, trade and distribution of shark fins and ray parts on island. The process of shark finning involves landing a shark, removing its fins and throwing its carcass back into the water, often resulting in the shark’s slow and agonizing death. Hawaii became the first jurisdiction to enact such a law, under the leadership of Hawaii State Sen. Clayton Hee. The CNMI, under the leadership of House of Representatives minority leader Diego Benavente, in January enacted a similar legislation. Both Hee and Benavente made visits to Guam to lobby for a shark fin legislation to be introduced. While here, both also met with Variety to share their experience with introducing a shark fin legislation in their respective communities. Both communicated their desire to prohibit shark fin trade in the entire Pacific region, making it difficult for Asian fisheries and fishing vessels to distribute and trade shark fins to other nations across the world. Shark fin is typically used for shark fin soup, a widely popular Chinese delicacy. Rob Stewart, producer of world renowned and multi-award winning documentary “Shark Water” also made a quick stop to Guam to rally and inspire Simon Sanchez High School, which bears the “shark” mascot, to encourage lawmakers and the community to support a measure that protects sharks. Bill 44, sponsored by Vice Speaker Benjamin Cruz, garnered widespread and international attention. Communities and animal rights activists from all over the world rallied behind the bill. Several notable news organizations and celebrities wrote about the bill’s enactment. In addition, a petition circulated online that accumulated tens of thousands of signatures, including those of celebrities, promoting Bill 44’s passage into law. The movement to protect sharks emerged because of reports indicating that the once abundant shark population—which has been scientifically proven to be a significant asset in the world’s ecosystem—is being depleted at an abnormally rapid rate. Shark population around the world has decreased by about 90 percent in the last 30 years, according to scientific evidence. Scientific studies show that 79 to 90 million sharks are slaughtered for their fins every year. Printed in the Marianas Variety on Thursday, March 10, 2011. Guam Says: No Soup For You! 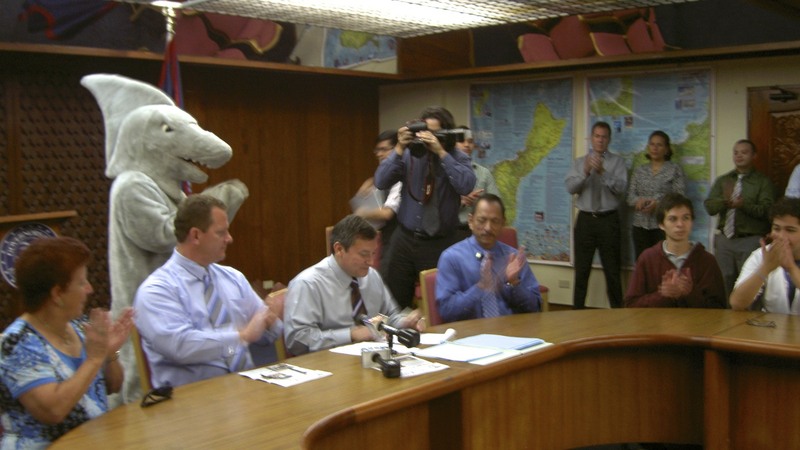 Shark Sanctuary: Guam Governor Eddie Calvo signs the shark fin ban into law. Guam Governor Eddie Calvo signed into law today a bill banning the sale, possession, and distribution of shark fins. The bill passed the Guam Senate on February 24 by a unanimous 15-0 vote. The new law had widespread support from Guam’s students, scientists, environmentalists, and three local fishing clubs. Local high school students started a shark tsunami in the community, with the goal of protecting threatened and near threatened shark species in Guam and supporting similar laws across the Pacific. Shark Tsunami: Students from Simon Sanchez High School and George Washington High School on Guam show their support for shark conservation at a public hearing on February 1, 2011. 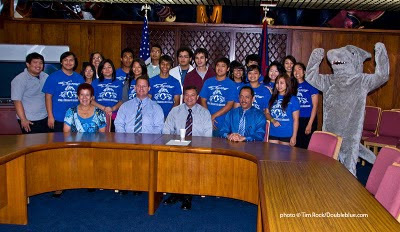 To support passage of the bill, the students, joined by conservationists and divers on Guam, along with an army of shark enthusiasts online, set an unofficial record for testimony received for a bill in the Guam Senate. They wrote letters, signed petitions, started a Facebook page and a blog, wrote songs and posted them to Youtube, and urged off-island activists to send emails. So many emails were received that at the start of a public hearing on the bill, Senator Rory Respicio announced that the volume of emails had crashed the blackberries of Senate staffers compiling the testimony. According to the Pew Environment Group, up to 73 million sharks are killed every year primarily for their fins, which are valued for their use in shark fin soup, an Asian delicacy. As a result, 30 percent of the world's species are threatened or near-threatened with extinction. For an additional 47 percent of species, scientists lack sufficient data to properly assess their population status. Guam follows Hawaii and the Northern Mariana Islands as the first governments in the world to ban shark fins as a conservation tool to protect shark species. So what is next for Shark Tsunami? Shark Victory! 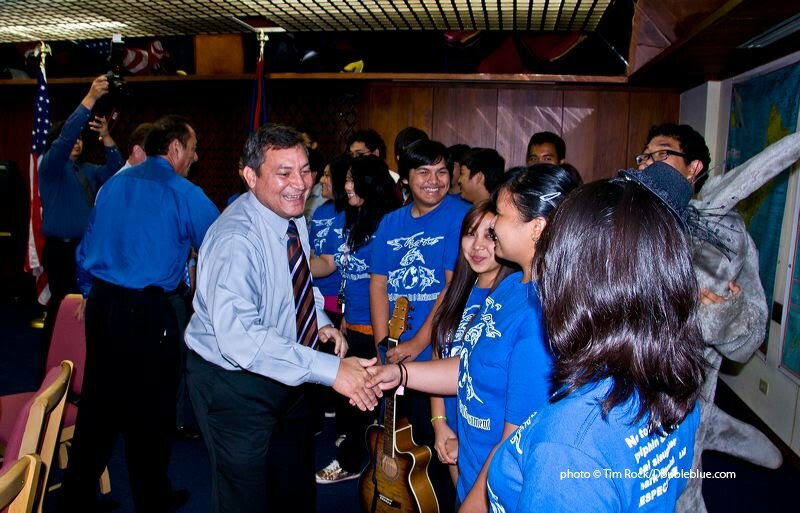 : Students from Simon Sanchez High School with Guam Governor Eddie Calvo and Lt. Governor Ray Tenorio. More pictures from the signing are posted on the Shark Defenders Facebook Page. The Fisheries department in the Marshall Islands is working on legislation to regulate the trade of shark fin and sea cucumber. The Marshall Islands Marine Resources Authority placed a ban on the two marine products this week until new procedures are in place to regulate them effectively. Our correspondent Giff Johnson says people have been violating the regulations for sometime and authorities are worried the marine resources would diminish if nothing is done about it. Giff Johnson says the fisheries department is hoping to complete draft legislation on shark fishing by August and will be discussing a plan of action on sea cucumber in the next weeks. The Pew Environment Group has issued a press release applauding Guam and other Pacific islands for taking action to safeguard the lives of sharks. "More and more, we see the islands of the Pacific stand tall against commercial fishing fleets that are depleting shark populations," said Matt Rand, director of Global Shark Conservation for the Pew Environment Group in the release. "Pacific island leadership is helping these fish, threatened by the fin trade, to keep their place as apex predators in the ocean food chain. 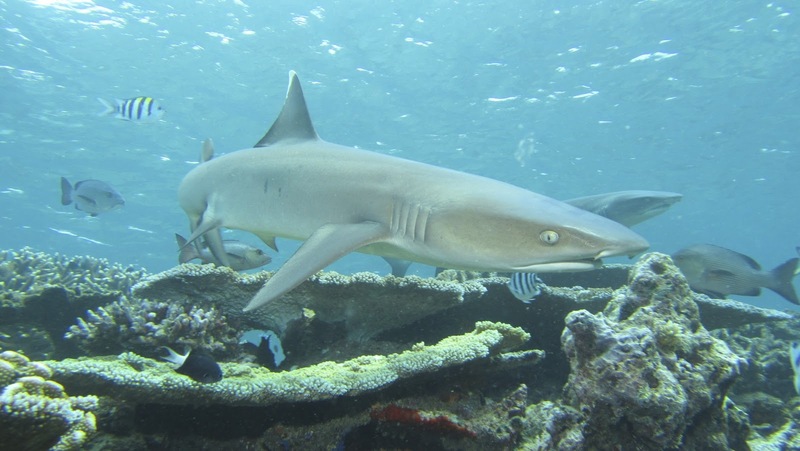 Guam, a major fishing hub, now joins other Pacific Ocean voices in support of shark conservation." On Thursday, a bill banning both the finning and feeding of sharks passed unanimously in the 31 Guam Legislature. If signed into law, Bill 44, introduced by Cruz and co-sponsored by Sen. Rory Respicio, will prohibit the possession, selling, trading or distribution of shark fins and ray parts on Guam. The law is similar to recently passed federal legislation introduced by Guam Delegate Madeleine Bordallo. Signed by President Obama in January, H.R. 81, or the Shark Conservation Act of 2010, prohibits the removal of fins at sea and the possession, transfer or landing of fins not naturally attached to the corresponding carcass. According to the Pew Environment Group, up to 73 million sharks are killed every year primarily for their fins, which are valued for their use in shark fin soup, an Asian delicacy. Thirty percent of the world's species are threatened or near-threatened with extinction, according to Pew. In Bill 44, a prohibition on feeding sharks was added as an amendment at the behest of some members of the fishing community, who said the practice could endanger fishermen. The law, which makes possession of shark fins and ray parts a felony, provides exemptions for those possessing shark fins or ray parts for "subsistence and traditional and cultural" purposes.